After delivering Madi (birth story here) we were fortunate to snag a spot in the hospital hotel. It's a very busy time of year so there was a possibility we wouldn't be able to stay there. We got checked in around 10:30 pm Thursday, June 20th after Madison's delivery. The rooms are actual hotel rooms and we had a double, meaning that Jason was able to stay there with me. They have midwives on call 24/7 to assist with answering questions, helping you breastfeed, and anything else that you are concerned about. During our next three days at the hotel we took advantage of the help! We called the midwives to come check on me during feedings and make sure she was latching properly. They checked her weight during the weekend and encouraged me to start pumping because Madi was losing a little bit too much weight. Fortunately, she picked her weight back up at our visit to the helsestasjon after we'd gone home. We had a good first night and the next two nights were a little rough. When Madi wasn't getting enough food she was having trouble sleeping. We allowed the midwives to take her both Friday night and Saturday night for a couple hours to allow us to get some rest. We had all our meals at the hospital cafeteria and it was so nice to be able to just spend time taking care of Madison and not worrying about anything else! We spent a lot of time starting at this little cutie! 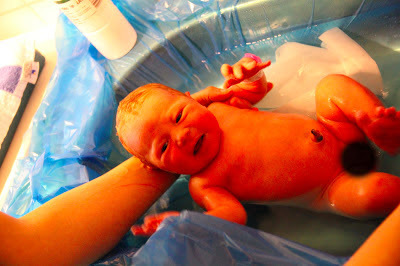 They also helped us give Madi her first bath and showed us how to take care of her umbilical cord. She was not a happy camper with the bathtub! We took a trip up to the 7th floor to see my midwife who I've gone to for all my appointments. She was excited to see us and meet Madi! We also got a chance to visit with some of my fellow ConocoPhillips co-workers! Ingi and Hugrun welcomed their little boy into the world on June 20th as well and Stig Arne welcomed his little girl the day before. On Sunday we got everything packed up to head home. We enjoyed the stay at the hospital and all of the advice and help we'd been given, but were ready to go home! And slightly terrified to take her home as well. :-/ But she was stylin' in her personalized "Newest and Cutest Stingerie" outfit!